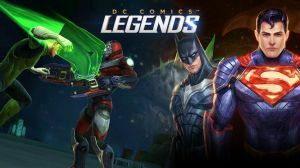 DC Legends is a free-to-play turn-based tactical game based on the heroes and villains of DC Comics. The game involves assembling teams of four heroes and/or villains and then using them to battle through single-player skirmishes, PvP clashes and Timed Events. Each of the characters has a variety of attacks and their own special abilitiy, they also fall into one of three different categories that uses the rock–paper–scissors as its core fighting system - Physical (Red) > Mystical (Blue), Mystical > Energy (Green) and Energy > Physical. No discussions open for DC Legends at the moment.